Free shipping on more items! NYCeWheels is here to deliver…for free! We’ve expanded our free shipping selection to Kleefer Kick scooters, and select Tern and Dahonmodels! We strive to make the process of investing in a high quality bike as quick and easy as possible, click below and look for items with the “free shipping” banner! Stop by the shop this weekend to experience the life of a Brompton owner for a day…FOR FREE! We’ll give you from the time we open, to the time we close, to stop by and pick up a Brompton to use for the day. We have a limited selection of demo bikes, so don’t miss your chance to try the worlds most highly regarded folding bike for yourself! It’ll be first come first serve. Stop by this weekend on April 15th and 16th to experience Brompton for yourself! FlyKly Smartped, The New Way to Kick! The FlyKly has definitely been stirring up a big buzz at the shop lately, and for very good reason! This new “kick assist” electric scooter is the first and only of it’s kind, and is a great new way to cruise your city! Redefine what it means to ride an electric scooter with this 100% street legal ride. 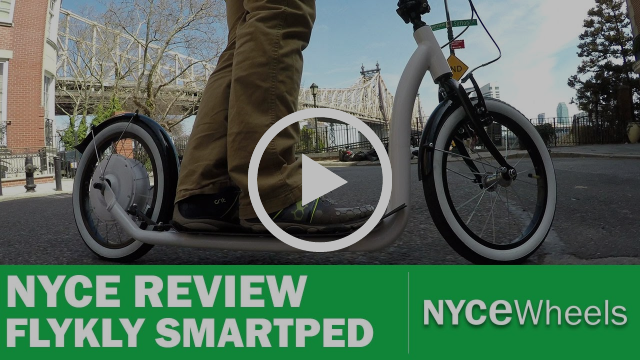 Check out our full review on the FlyKly Smartped in the link below, and definitely come by to test ride on in store if you can, we think you’ll love it as much as we do! Hummingbird | Worlds Lightest Folding Bike! © by NYCeWheels. All Rights Reserved.